Just in time for Halloween, one-man developer Quarternion Studios are releasing their side-scrolling brawler Rock Zombie on the Wii U October 30, 2014. There are two obvious music-based puns one could make from the game’s title. A big no-prize if you can find both! Rock Zombie is not exactly a AAA title in quality. The animations are a bit choppy and limited, and the overall presentation focuses more on eye candy character models than anything else. On the other hand, it’s a $6.99 downloadable title, is currently Wii U exclusive, and is entirely the work of one man, Miguel Jose Garcia. As such, some shortcomings should be expected, and can even be forgiven in light of the amount of content Miguel’s label Quarternion Studio has tried to put into the game. Rock Zombie starts players off with a story focused around a rock trio made up of three girls: Zoe, Sasha, and Crystal. During a concert the girls’ play session is overrun by none other than a horde of ravenous zombies. 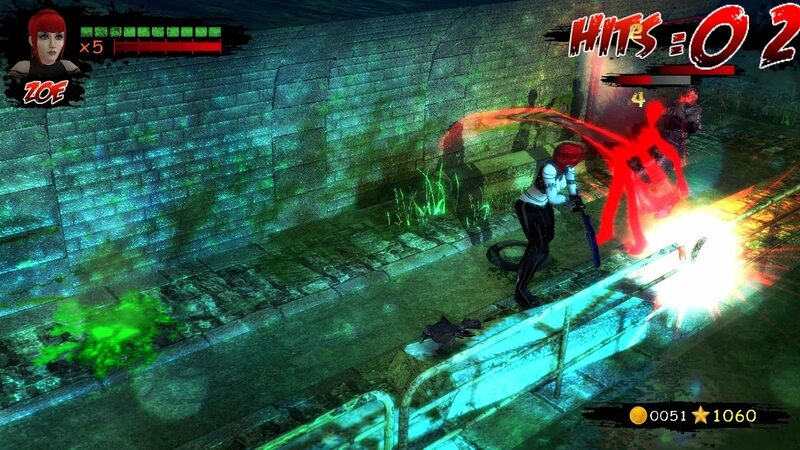 Players will take control of one of the three girls and then proceed to bash their way down city streets, including diversions such as car and motorcycle segments, all while traversing the game’s 20 or so levels. At its heart Rock Zombie styles itself on classic side scrolling beat ’em ups like Golden Axe or the Double Dragon games. Players have access to a variety of weapons (mostly focusing on guitars, however,) and a number of special abilities they can employ during fights. Unlike the games that inspired it, though, Rock Zombie is not confined to a standard 2D plane, and uses this to provide players with both more dynamic camera angles at times, shifting to isometric or cinematic angles for certain shots, or even going behind the player for many vehicular segments. Rock Zombie will be available on the Wii U virtual console starting October 30, 2014 for $6.99. For now, the game is Wii U exclusive, though Quarternion Studio and publishers EnjoyUp do intend to bring the game to PC via Steam at some point in the future as well.